The Art department at Christ's aims to engage, inspire and challenge students, equipping them with the knowledge and skills to experiment, invent and create their own works of art, craft and design. As students progress through the school, they should be able to think critically and develop a more rigorous understanding of Art and Design. They should also know how Art and Design both reflects and shapes our history, and contributes to the culture, creativity and economic growth of the world around them. The department has two large well-equipped specialist rooms with an adjoining kiln room and is led by Mr Hordern, an Art specialist, and Head of the Art and Technology Facility. It produces consistently excellent results, above national averages. The Department ensures all schemes of study cover the traditional aspects of Art and Design, material topics such as painting, sculpture and printmaking, whilst recognising the need to teach specific contemporary skill sets in digital media and photography. The teaching of A Level Art and Design at Christ’s is broad and contemporary, seeking to immerse students in an environment where their creativity is challenged and where outcomes reflect personal choices and attitudes. The course features both technical teacher-led workshops and independent project time; allowing students to realise ambitious and present well thought out responses. At Christ's we follow the OCR examination board syllabus. Students will explore ideas of personal significance and as such will need to demonstrate good research and sound justification in their project portfolios and very independent in their approach. Homework will involve both research and practical tasks, it is expected that for each lesson studied 1 hour of homework will also be completed. Students are expected to demonstrate an interest in Art and Design outside of school, actively visiting galleries and exploring the work of other artists. Students have every opportunity to work in the Department outside of lessons in numerous extra-curricular activities. 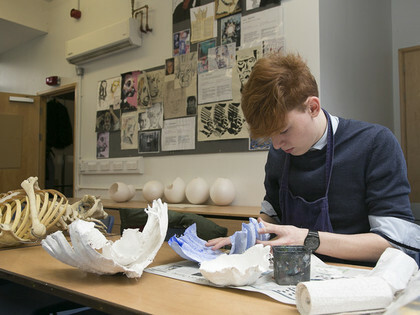 Many students who study Art and Design at A Level go on to pursue careers in the creative field and study a diverse range of university subjects. Year 12 students spend Term 1 completing a range of teacher-led practical workshops, ending with a PPE produced final piece under timed conditions. In Terms 2 and 3 students choose their own topic from past papers and respond in a wide range of styles and media. Outcomes are encouraged in painting, printmaking and sculpture. Year 13 students work on self-titled projects and specialise in one area, or can produce a combined portfolio showing a range of approaches for examination. Students have exhibited photography, video and installation, alongside painting, printmaking and sculpture. Christ's Art and Design department has a proud history of involvement in local and national Art competitions and awards. Students’ work from all stages is exhibited yearly. Numerous opportunities are available through clubs and afterschool workshops. None required for the course. N/A. The exam is practical and therefore there are no revision guides.